Step 1: Open the Battery Cover (underneath the mouse), Install Alkaline AAA Battery. Step 2: Plug the USB Nano Dongle in the USB Port. Step 3: Intelligent connectivity, No Need to Code, Plug & Play. Frequency:	2405 MHz - 2476 MHz. IBM or compatible Computer, Window 2000/ME/XP(x64)/Vista/7/8, Mac OS(More than V10.4), Workable USB Port. 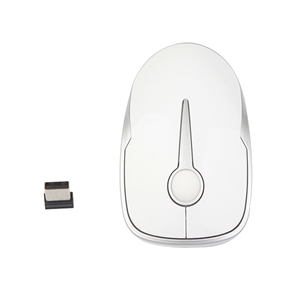 Nano/USB receiver hidden in the mouse button. USB nano dongle, more convenient when plug in USB.